I know I use words such as “the best” and “the best I’ve ever had” quite a lot. But, in my defense, I only write about food that was superb and that I fell in love with. Second point in my defense: I don’t think there is such thing as bad food in Quebec City. In five days that I spent there I didn’t have one bad meal. I will go as far as to say I didn’t even have a mediocre meal. Surely, I had spent hours choosing each and every restaurant I visited, but even so, that’s quite impressive. 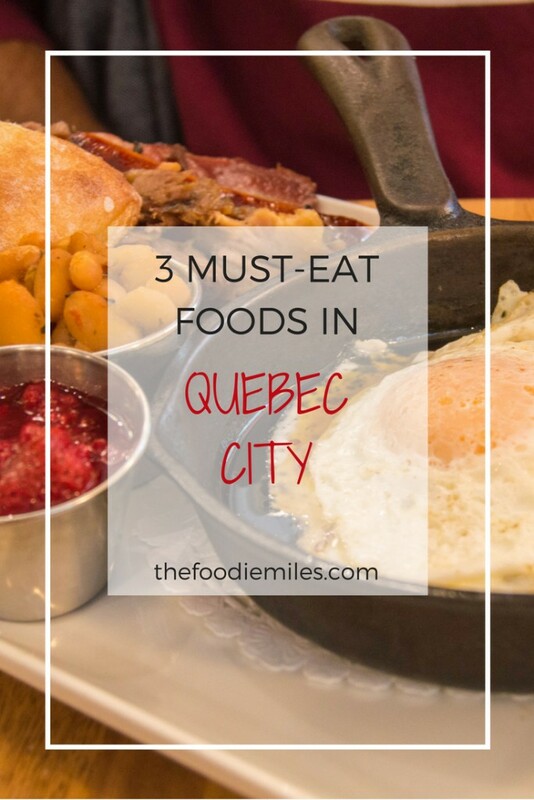 If you are looking for places to eat in Quebec City, here are three foods that are a must-try, in my opinion! 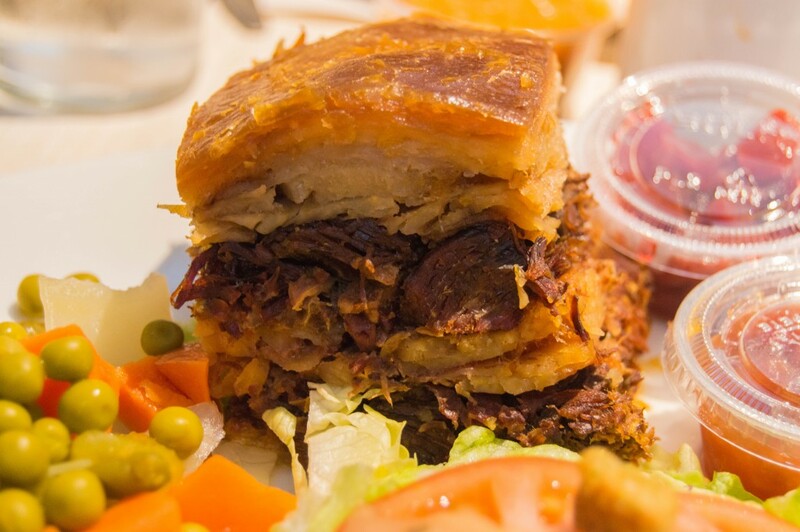 Le Cipaille, or meat pie, is a house specialty and one of the most traditional Québécois dishes that you must try in this region. Cipaille is pronounced sea-pie. According to Wikipedia, the name most likely originated as an adaptation of sea-pie because it had been served to British sailors during 18th century. At Buffet de L’Antiquaire, it is made with beef, veal, pork, and potatoes. Local cuisine is extremely rich, fatty, and filling, but this pie would take the first prize in category “The ultimate comfort food”. It made for a perfect lunch after a cold windy morning spent exploring Montmorency falls. 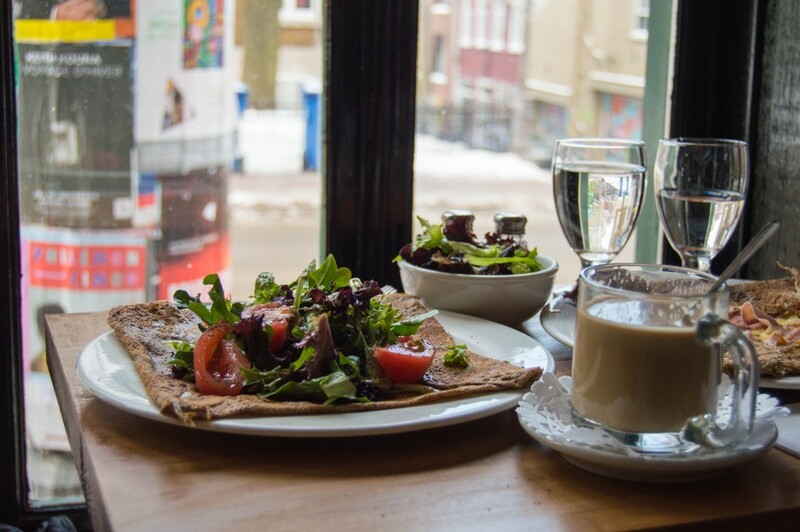 I came across this place while browsing through a blog of Allison Van Rassel, a foodie who is passionate about Quebec. 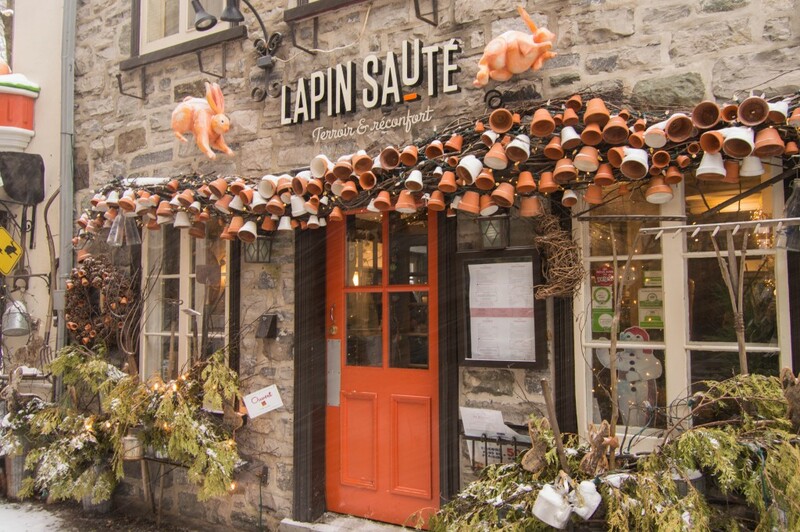 If you are planning a trip to Quebec, this is a great resource for dining ideas. 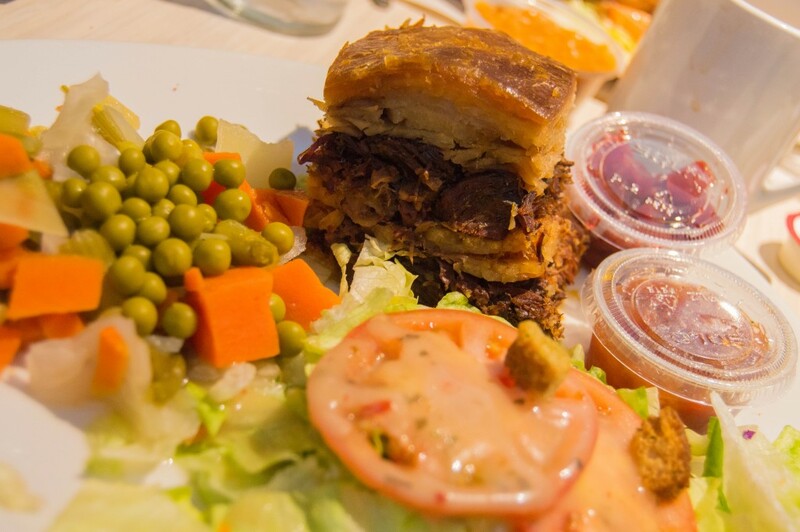 According to Alisson, Buffet de L’Antiquaire is the most authentic and traditional Québécois food you can find in Quebec City. They recently did renovations. It is a small restaurant with a mezzanine. The crowd was mostly speaking French that I took as a good sign: locals know where to find great food. 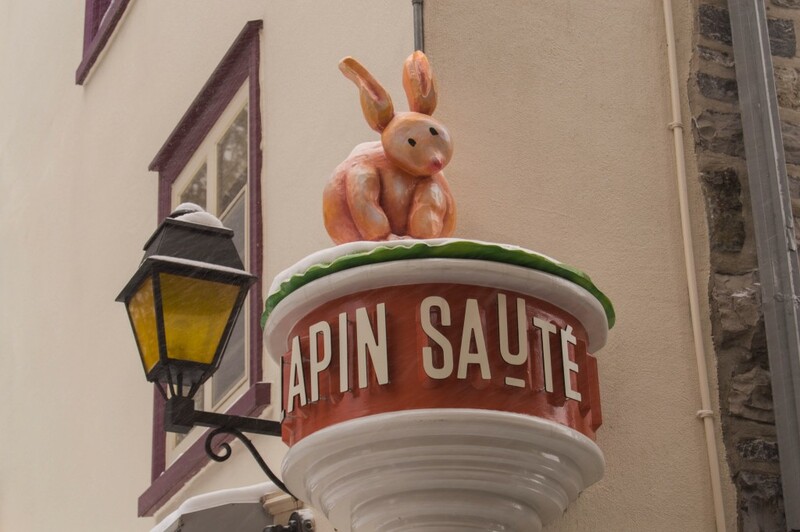 The name of this restaurant translates as “Jumping Rabbit” so, not surprisingly, rabbit is their specialty. It comes from a local farm La Ferme Besnier in La Beauce not far from Quebec City and these guys, most certainly, know how to prepare it. 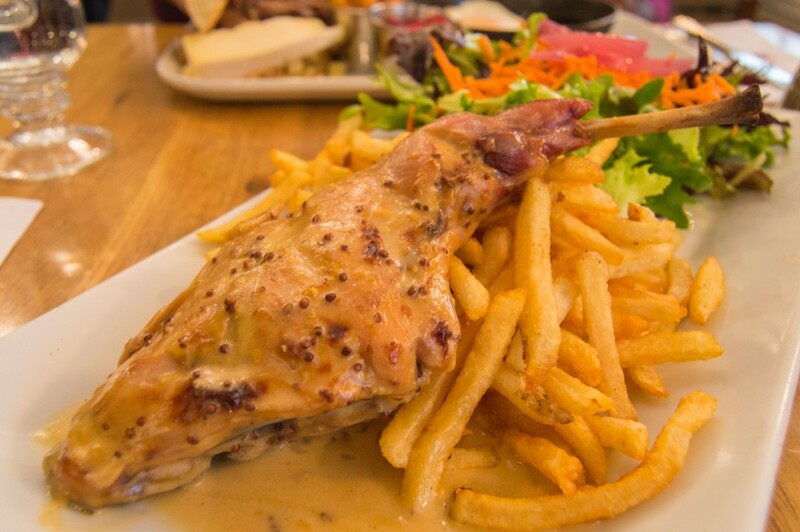 Try the rabbit leg: its most delicate and tender meat is perfectly complemented by two-mustard sauce. 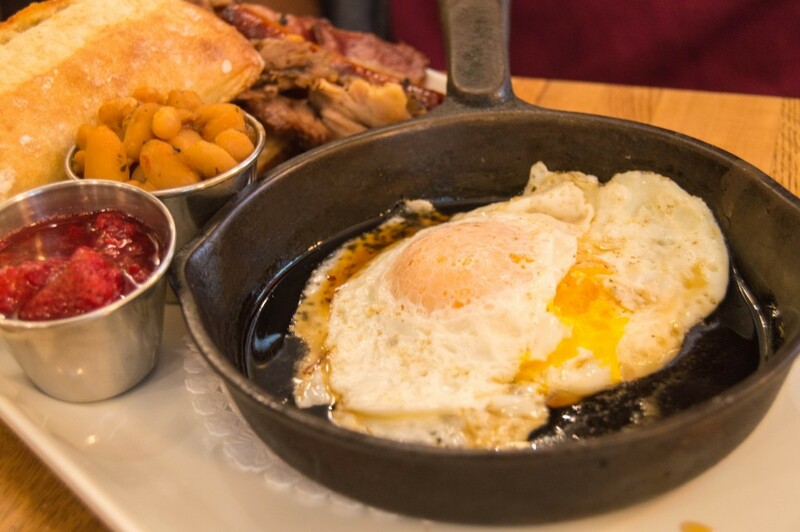 Or start your day off with a perfect brunch plate. It features eggs fried in maple syrup – the biggest discovery of the trip! To a non-Canadian it sounds extremely weird but works well. It was my second day in Quebec, and I was still to learn in how many different ways you can use maple syrup. Along with eggs come rabbit rillettes, which is mixed with potatoes for a more “breakfasty” feel; maple baked beans (more maple); and La Sauvagine cheese that surpassed my highest expectations. 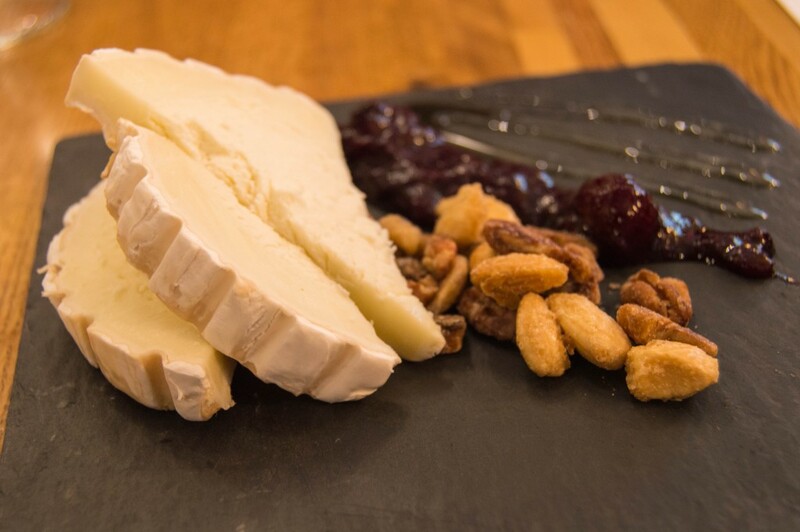 Talking about cheese, don’t miss out on their cheese platter appetizer. 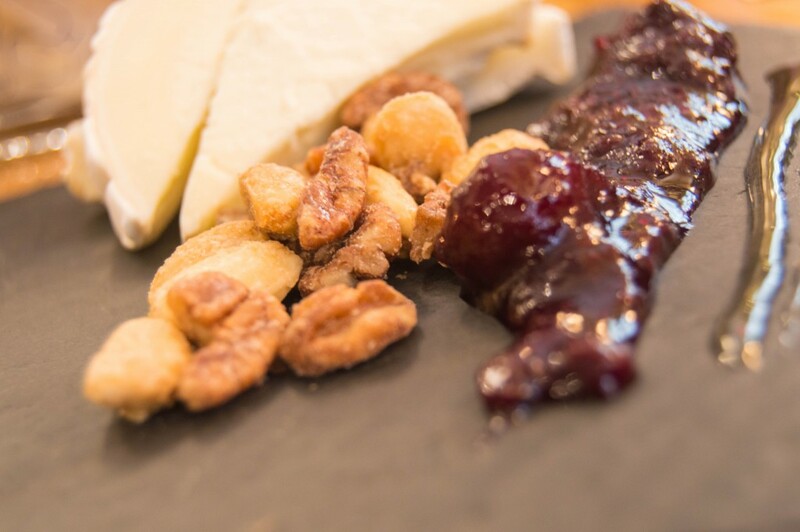 All cheeses are sourced locally and served with mixed maple-flavored nuts (hello again, maple! ), and a blueberry-cranberry spiced wine compote. We were told by the waiter that the nuts are called “heaven”. Guess why? Because it’s heaven! Well, she was not lying. Among all the places to eat in Quebec City, this was, hands down, my favorite. We stayed nearby and ended up coming to this bistro three times in five days. I think it says a lot. 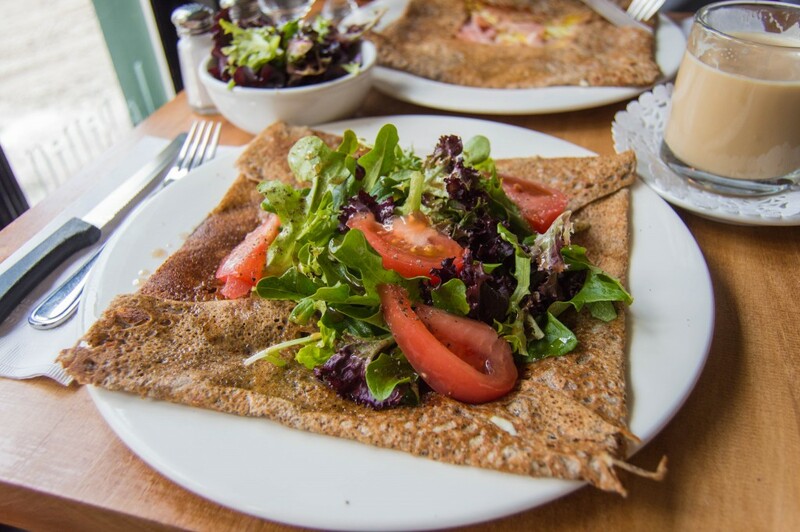 All savory crepes are made with buckwheat flour and all sweet crepes are made with wheat flour. These organic flours are a product of a Quebec-based flour mill. These types of flour are healthier and they bring an unconventional flavor and crispiness to crepes. 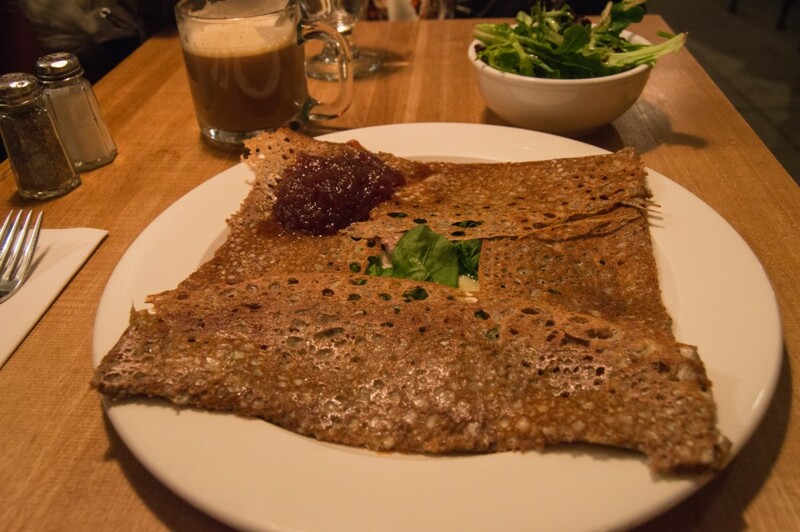 If you are looking for a savory option try The Béarn – a crepe filled with duck confit, Swiss and goat cheese, and served with onion marmalade. Onion marmalade is what does the trick and makes the taste unforgettable. If you have a sweet tooth, try The Extreme. 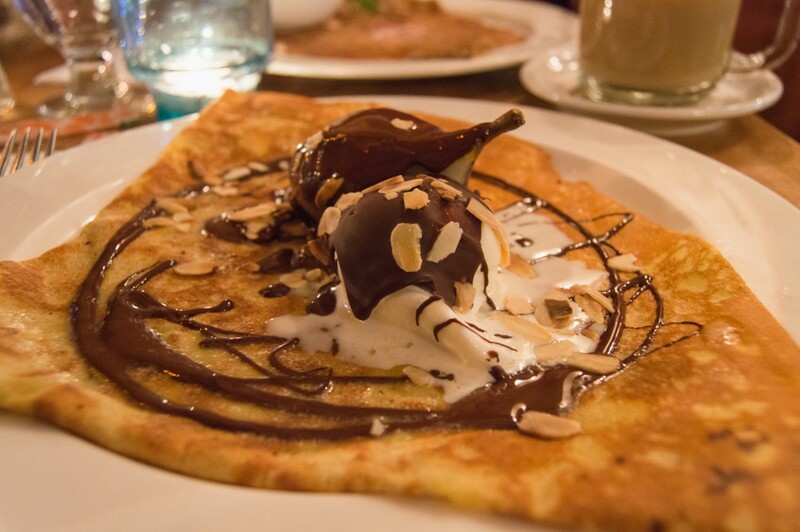 It is served with a poached pear and a scoop of vanilla ice cream, covered with dark chocolate sauce and almond flakes.